Model United Nation an academic setting to stimulate and address current issues faced at global scenario was conducted at Asian Business School on 3rd August 2013 on “Arms Trade Treaty”. The objective of an intra structured MUN was to provide our students a platform where they can address their thought process on poorly regulated global trade in conventional arms and ammunition fuels conflict, poverty and human right abuse. Thousand of people suffer from direct and indirect consequences of the irresponsible arms trade, while many others have to live under constant threat of weapons. Those suffering most are civilian populate trapped in situation of armed violence in setting of both crime and conflict, often in conditions of poverty, deprivation, and extreme inequality, where they all are frequently on the receiving end of the misuse of arms by state armed and security forces, non state armed groups and organized criminals. Students of ABS represented themselves as delegates of different countries viz. Bangladesh, Canada, China, North Korea, India, Cuba, Italy, UK, US, Iran, Japan, etc. with a common idea of transforming world into a terror free state. The objective was to draw attention towards integrated social initiatives, economic, government trade and environmental policies that can be implemented to ensure a terror free society. All the representative delegates highlighted their country’s perspective in reference to Arms Trade Treaty. The purpose of this was to understand and acknowledge the strategies and policies adopted by different countries to acknowledge their ideas for contribution towards international and regional peace, security and stability, reducing human suffering, promoting cooperation, transparency and responsible actions taken on the this front. 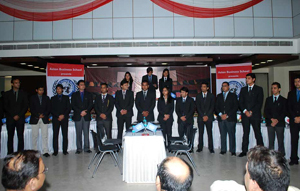 MUN being an academic simulation not only helped students to focus on current global issues but has also helped in cultivating a common sense of responsibility towards world. Apart from this, MUN helped in generating the awareness related to illegal arms trading and its retrospective effects. Huge acknowledgement and appreciation was given to all participants who tried hard to make this simulation exercise an absolutely structured and formal debate, working hard from its inception to its execution.